We are pleased to welcome back Michael Long. He is a freelance author and historian and has written many articles on medieval and Tudor history mostly in the UK. He has spent more than thirty years teaching history and is presently writing a novel based on the exploits of Willikin of the Weald. 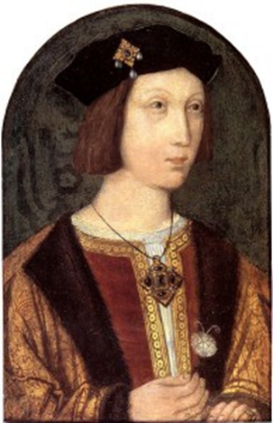 On 2nd April 1502, at Ludlow on the English-Welsh borders, Arthur Prince of Wales died: he was just fifteen-years-old. Named after the mythical English monarch, Arthur was the future of the Tudor monarchy, and while he lived, the Tudor succession was assured. His death left King Henry VII with just one young son and increasingly fearful of usurpers and assassination. Contemporary opinion was that Arthur died of sweating sickness. More recently, historians have speculated it was influenza, tuberculosis or the side effects of type 1 diabetes. Sweating sickness, unknown in England before 1485, mimicked some of the symptoms of these diseases with headaches, cold shivers, joint pain, exhaustion, uncontrolled shaking and hot sweats. Arthur had fallen sick with similar symptoms shortly after he married Catherine of Aragon in November 1501 but had apparently recovered. Both Henry and Queen Elizabeth were distraught when they were told that Arthur had died. Both invested their hopes in Catherine being with child, the couple having lived together for five months. Diplomatically his death was a catastrophe for Henry, as Catherine was the daughter of Europe’s most powerful King, Ferdinand of Spain. A carriage draped all in black was sent to Ludlow to transport Catherine back to London. Under orders, it made pitifully slow progress because both Henry and Elizabeth believed Catherine to be pregnant with the precious Tudor heir. Once back in London, it soon became apparent that the Princess of Wales was not expecting. Instead it was Queen Elizabeth who fell pregnant at the age of thirty-six. In late January 1503, Elizabeth moved into the royal apartments at the Tower of London to give birth. On 2nd February, following a difficult labour, she gave birth to a baby girl, named Catherine. Within a week the infant princess was dead and the next day, her thirty-seventh birthday, Queen Elizabeth died following complications from the birth. King Henry was again devastated by the loss of a wife he had grown to love. For six weeks he shut himself off from the royal court and fell ill with a form of pneumonia. If news of the King’s illness leaked to the court and beyond to his rivals abroad, it could have meant disaster for the Tudor regime. The new heir, Prince Henry was still a boy of eleven, and Yorkist claimants could have mounted a rebellion with the prospect of success. Much had been invested in Arthur as heir to the throne and his younger brother, now the only surviving son and sole heir had not been groomed for succession from birth. These were bleak years for Henry. The death of his wife coming so soon after the death of Prince Arthur and the earlier death, in 1500, of the year-old Prince Edmund, took its toll. Moreover, those close companions in his formative years were either already dead or dying. His uncle Jasper in 1495, Cardinal Morton in 1500, Sir Thomas Brian, Lord Dinham and then in 1503 Sir Reginald Bray. Surrounded by such reminders of his own mortality Henry became increasingly withdrawn and contemplative. Laughter and gaiety at the royal court were conspicuously absent after 1503. By March 1503, when Henry reappeared at court he had visibly aged. The chronicler Polydore Vergil noted Henry was, “care-worn and sapped of energy with a sallow complexion.” The Tudor dynasty now hung precariously by a thread; to secure the royal succession, Henry needed another male child. This demanded that he remarry. However at forty-six, Henry was entering old-age by Tudor standards. Writing to King Ferdinand, the Spanish Ambassador, Roderigo De Puebla commented on Henry’s greying hair and rotten teeth. But, the main reason for the correspondence was to inform Ferdinand that Henry had decided to take as his new bride the young, seventeen-year-old Princess of Wales, Catherine of Aragon. Upon receipt of this news, Catherine’s mother Isabella of Castile, was shocked, writing that this proposal was ‘Un mal abominación que ofende a los oídos’ ( an evil abomination that offends the ears.) Isabella instructed the Spanish Ambassador to demand of Henry that he return Catherine to Spain, no doubt so she could evade his lechery. Henry was not seeking marriage to his daughter-in-law just to produce another male child but to settle the thorny issue of the balance of Catherine’s dowry of 200,000 Gold Crowns, half of which had been paid. With Arthur dead, Henry was refusing to return the payment to King Ferdinand of Spain, and with Catherine in England, Henry had to bear the cost of her considerable royal household expenses. Indeed Henry expected the balance of 100,000 Crowns to be paid in full. Henry now considered his former daughter-in-law a pawn in the game of European power politics. Catherine wrote to her mother expressing her distaste at marrying her ageing father-in-law. Her mother, Queen Isabella, devised her own plan to divert Henry’s attention away from Catherine and towards her niece, the twenty-six-year-old Joanna, widowed Queen of Naples. Joanna was renowned across Europe for her beauty and had been widowed aged seventeen and had not remarried. 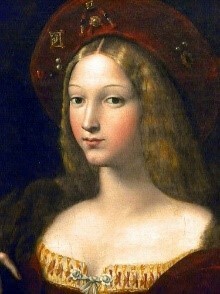 King Henry sent a delegation to Valentia to discover more about Joanna. Henry instructed John Stile to find out about Joanna’s appearance. He wished to know the colour of her hair; the condition of her teeth; the shape and size of her nose and eyes; the state of her skin and complexion and whether she had hair on her face. He instructed them to pay particular attention to her breasts, “… whether they be big or small.” He was delighted to find out that they “be somewhat great and full, comely and not misshapen”. Queen Isabella’s ‘plan’ to divert Henry’s attention away from Catherine was successful as Henry did pursue marriage with Joanna, but it ultimately failed for both political and financial reasons. 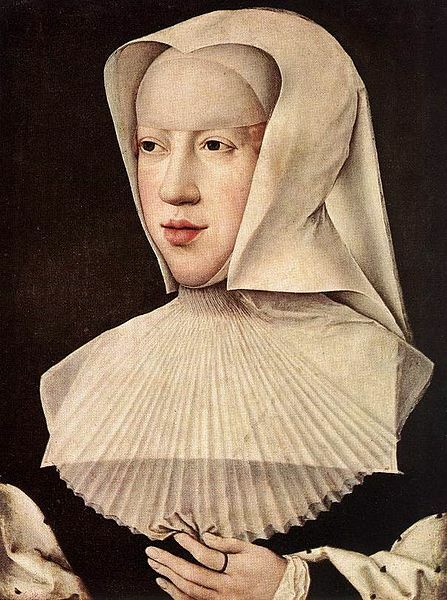 Although no record survives of how Catherine felt at not having to marry Henry, it may be assumed that she was delighted his eye had fallen elsewhere. By 1504, with marriage plans to a European princess still in progress, Henry decided to maintain the Anglo-Spanish alliance and the trade agreement that went with it. This meant resurrecting arrangements for a marriage between Catherine and Prince Henry, seven years her junior. At this time Catherine’s health was not good; in August 1504 she was diagnosed with ‘an ague’ of the stomach, and a physician was sent to bleed her. All attempts at bleeding failed, and the diagnosis of the Spanish doctor was that her ill-health was caused by abstinence from sexual activity and what was required was a husband. 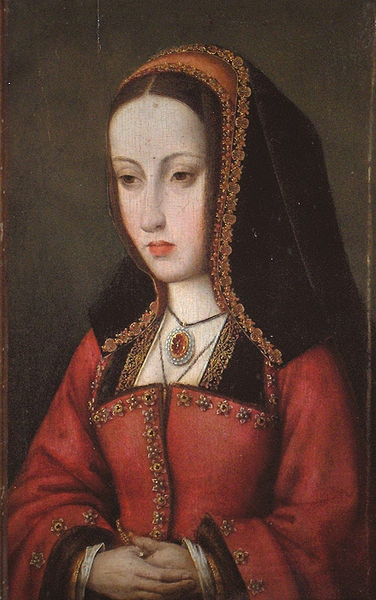 In November 1504 Catherine was distressed by the news of the death of her mother, an event which would prompt both a conflict over the Castilian succession and allow King Henry to plan for young Prince Henry to marry the eight-year-old Eleanor of Castile, the daughter of the Duke of Burgundy. To achieve this King Henry made his son appear before the Star Chamber to swear that any marriage contract between himself and Catherine had been arranged without his knowledge or approval and that he would never consent to this marriage and that the marriage was null and void. King Henry arranged for Prince Henry’s appearance in total secrecy so as not to alert the Spanish Ambassador to his true intentions. At the same time, he told the Ambassador, De Puebla, that Catherine’s marriage to Prince Henry could not proceed until the remainder of her dowry arrived in London. When it became apparent that marriage plans with Joanna had stalled, Henry pursued Margaret of Savoy, who was the daughter of Maximilian I, the Holy Roman Emperor. Margaret had been twice widowed and had not desire to marry again. The Venetian Ambassador was instructed to tell King Henry that she was “ averse” to the idea of marrying him. Undeterred Henry had a portrait of himself commissioned and sent to Margaret but to no avail, she refused all his advances. Henry’s attention then turned to Catherine’s older sister, another Joanna and mother of Eleanor of Castile. She had recently been widowed from her husband the Duke of Burgundy, Phillip the Handsome. His death had caused her much grief, and she refused to allow him to be buried and travelled everywhere with his corpse, earning herself the nickname, Joanna ‘La Loca’ (the Mad). Catherine wrote to her father encouraging the proposed marriage, believing Joanna would benefit from having a new husband as well as showing her political astuteness in suggesting that the wedding would strengthen the Anglo-Spanish alliance. The question of the dowry remained. King Henry wanted the remainder of the dowry to be paid for Catherine, but Ferdinand refused, expecting the balance of the first payment to be returned to him by Henry. Henry ordered that Catherine was to be denied access to the young Prince Henry, even though they lived in the same palace at Richmond. Perhaps Henry intended this as a plan to put pressure on Ferdinand as Catherine wrote to her father saying that she would not give up on the idea of marrying her late husband’s brother. Also, Henry had to ‘persuade’ the Pope to grant special dispensation for Catherine and Prince Henry to marry for Canon Law forbade a man to marry his brother’s widow. Henry had to make a substantial payment to Rome for granting the dispensation, and Catherine had to make written testimony that her marriage to Arthur had never been consummated during their five months of married life. Despite the renewal of commercial agreements in 1504, Anglo-Spanish relations soured as trade declined between 1505 and 1506. King Henry blamed the Spanish and berated the Spanish Ambassador, blaming him for the economic downturn. “All the words that came from his mouth were vipers,” noted one Chronicler of Henry’s meeting with De Puebla. But a vengeful Henry also took out his spite against Catherine, revoking her monthly pension of £100, which compelled her to give up her residence at Durham House on the Strand in London and move into the court. There she was allocated rooms in the least desirable place above the servants quarters. In all this, Catherine bore herself with dignity and courage. Thoughts of who the monarch should marry and the marriage of Catherine to Prince Henry were put to one side in February 1507 when King Henry contracted tuberculosis. So grave was his condition that his mother, Margaret Beaufort paid twenty shillings for a Book of Mourning to be made and £57 6s 8d for black mourning cloth. Remarkably Henry pulled through and by the late summer was, according to the Spanish Ambassador, in “…the best health of many a year.” In private Henry’s paranoia had increased, however. He feared assassination and access to his Privy Chamber were severely restricted. The following February he had a relapse, and the tuberculosis, his physicians called it a ‘ quinsy,’ returned. By March 1508 he was sufficiently well to see Don de Fuensalida, sent by King Ferdinand to offer money to Henry to speed up Catherine’s marriage. All that summer Henry’s health deteriorated, and Catherine wrote to her father begging him to intercede to facilitate the wedding. Henry, for whatever reason, refused to see de Fuensalida. In the autumn of 1508, Henry rallied enough to go on pilgrimage to Canterbury and Walsingham while engaged in petitioning the Pope to canonise King Henry VI. On 20th April 1509, King Henry died to be succeeded by his only surviving son, Prince Henry. Henry became King without the years of preparation and grooming his brother had received. 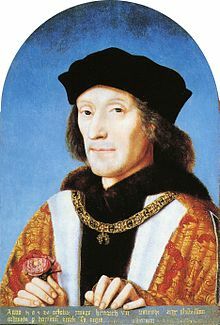 Since Arthur’s death, Henry VII had kept his new heir close to him, rather than despatch him to the Wesh borders to learn the art of governing. As a result, Henry’s education in kingship was limited, and King Henry sought to ‘reinvent’ Arthur as Prince Henry. Like his brother, Henry had received a scholarly education under poet John Skelton to 1502, then Giles Dewes and finally William Horne. Yet despite this classical schooling, aged just seventeen, he was ill-prepared for the judgements of kingship. As the new Henry VIII, one of his first acts as monarch was to revoke his oath before the Star Chamber in 1505 and marry Catherine, in a private ceremony at Greenwich Palace on 11th June 1509. After nearly nine years in England, Catherine of Aragon was finally Queen. Since Mary Boleyn was my grandmother I believe her two children were by Henry VIII when she was his mistress. Great article very well written. Loved it. An interesting post, thank you.